Couldn't be happier with this beautiful and inspiring art! I bought this as an engagement present and they LOVED it. 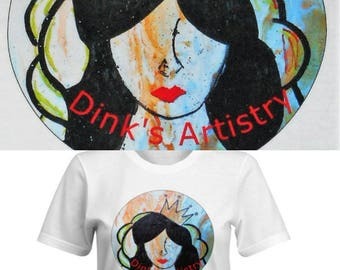 I love DinksArtistry art since I first saw her work at an art show a year ago. High quality work and such a pleasure to work with. I highly recommend DinksArtistry. As amazing as the pictures look, they are breathtaking in person. I recently bought the Color Block Initials for both of my nephews and their partners as engagement presents from DinksArtistry. They all loved the gift and I was so happy that I purchased them. Any time I needed to contact DinksArtistry, I always heard back right away. When I initially ordered them, I had put in the wrong address and DinksArtistry made it so easy to correct my mistake. DinksArtistry sent me photos of the work in progress and the final paintings and I was thrilled with the finished product. DinksArtistry work is even better in person, the photos do not do her talent justice. The color block initials make the best engagement, wedding or new house gifts. I can't wait to see more of her work! I'm an abstract artist that uses shapes and vibrant colors to create what I call Geometric Art. I use my style to create portraits with a twist. My favorite art form is Art Deco as it too uses distinct shapes to create works of art. I enjoy using bright, vivid colors to enhance my paintings. My motto is ART IS TRYing! (Artistry) and I encourage all to constantly create! Love painting portraits with a twist! I've been painting since high school and finally feel the world is ready to experience Dink's Artistry! Welcome to Dink's Artistry where I strive to bring the best authentic abstract art! Please allow 1-2 weeks to ship from date of purchase.